The global intelligence virtual assistant market is highly fragmented in nature with a presence of a large number of players operating in it across the globe, states a new market research study. Some of the key players in the market are IntelliResponse Systems, Nuance Communication Inc., Next IT Corporation, and Creative Virtual Ltd. The key players in the market are focusing on the development of new products, which is likely to expand the product portfolio is expected to encourage the growth of the overall market in the next few years. In addition to this, the growing research and development activities and innovations in the market is predicted to enhance the level of competition in the next few years. The entry of new players is another key factor likely to accelerate the market growth throughout the forecast period. 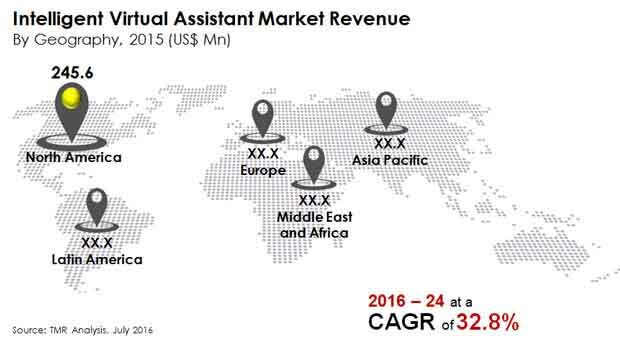 According to the market research study by Transparency Market Research, in 2015, the global intelligent virtual assistant market was worth US$627.7 mn and is projected to reach a value of US$7.9 bn by the end of 2024. The market is expected to register a noteworthy 32.80% CAGR between 2016 and 2024. The global intelligent virtual assistant market has been classified on the basis of geography into Latin America, North America, the Middle East and Africa, Europe, and Asia Pacific. Among these segments, North America is anticipated to account for a large share of the global market in the next few years and continue its dominance throughout the forecast period. The presence of a large number of multinational organizations is one of the key factors estimated to accelerate the growth of the North America market in the coming years. Furthermore, Europe is anticipated to register a significant growth in the coming few years. The Asia Pacific market is also projected to witness high growth in the next few years. The global intelligent virtual assistant market has further been classified on the basis of technology, among which the speech recognition segment is estimated to witness healthy growth throughout the forecast period. This segment is expected to offer potential growth opportunities for the market players, which is further predicted to enhance the growth of the overall market in the coming few years. On the basis of application, the website segment is expected to witness healthy growth in the coming few years and is estimated to remain in the leading position in the near future. In the last few years, social media has immense influence on the development of the intelligent virtual assistant market, which is considered as one of the major factors anticipated to encourage the growth of the overall market in the coming few years. The rising deployment of intelligent virtual assistant has gained a rapid pace in the retail sector, which is likely to generate promising growth opportunities in the coming few years. Technological advancements and innovations in this field are estimated to encourage the growth of the market in the near future. On the other hand, the high cost of intelligent virtual assistant is one of the key factors likely to restrict the overall growth of the global market in the coming years. The increasing time that is being spent on social media is one of the major aspects which is likely to accelerate the growth of the market in the near future. North America and Europe to witness high growth in the intelligent virtual assistant market throughout the forecast period.